Requirements CoP mission progress beyond 3-5, "Darkness Named"
Primary Map - Note: Orc Statue numbering is not complete. 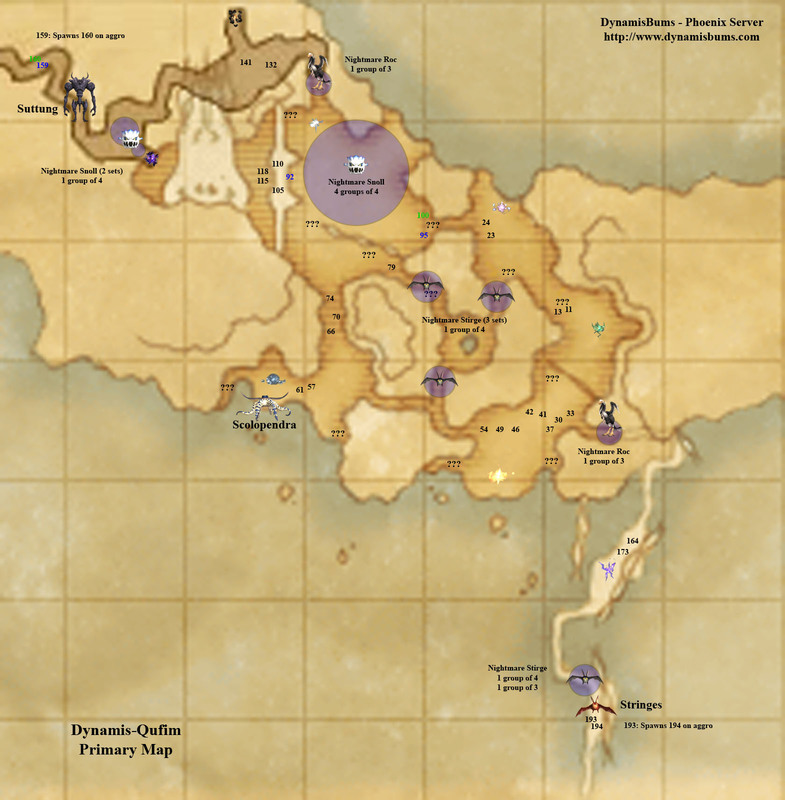 Boss/Respawn Map - Note: Statue numbering (Goblin respawns), Group listings of Nightmare Diremites/Raptors are not complete. Players entering Dynamis-Qufim are subject to a subjob restriction (no subjob). This restriction is removed once the appropriate ??? is located and selected. Pull and clear Nightmare Stirges south of the entry point. Players looking for the subjob ??? should use this opening to proceed to other portions of the zone. Move west towards NM Scolopendra, walking along the northern cliff to avoid Adamantking Effigies 57 and 61. Pull and clear Water Elemental to avoid later add. Pull and clear NM Scolopendra. Alliances may need to take care here, as subjobs may not necessarily be unlocked by this point. Pull and clear Adamantking Effigies 66, 70, 74. Proceed north, past Delkfutt's Tower, avoiding all statues, Nightmare Snolls, and wandering Ice Elemental. Pull and clear Nightmare Rocs. Nightmare Rocs are susceptible to Sleep (unlike normal, non-Dynamis members of the family) and AoE damage can be lessened by using a Stun rotation on the alliances' target. (Optional) Pull and clear Goblin Replicas 132 and 141. Pull and clear NM Suttung. It is possible to pull Suttung east towards the alliances to limit the amount of travel time needed, however, doing so can also link wandering Nightmare Snolls southeast of its initial position, and any remaining Goblins not cleared from Goblin Statues 132 and 141. Return to the northeast portion of Delkfutt's Tower. Pull and clear Ice Elemental. At this point, melee should be storing TP for use on zone boss Antaeus. 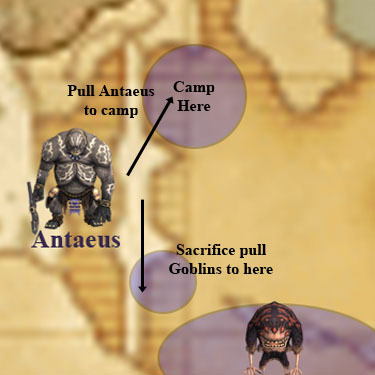 Though it may not be necessary if pathing can be controlled, a sacrifice puller (usually a THF) generally makes separating Antaeus from the surrounding Goblins much easier. Sacrifice puller draws attention of Antaeus (by proxmity) and statues to the east, pulling them away to the south. It is possible for a sacrifice puller to be raised safely after Nightmare Weapons spawn by not moving too far south and by staying close to the tower wall. A secondary puller quickly pulls Antaeus out of the link and returns it to the rest of the alliances staging north. To prevent massive damage from building up quickly from AoE, it is useful to have at least one RDM/DRK using Chainspell and Stun to keep Antaeus from acting. Players that can pull hate must distance themselves from other players. Trebuchet has a significant range on its AoE that can easily kill clustered melee and mages. Melee close to Antaeus should keep multiple (3+) shadows up at all times to prevent damage from Grand Slam. Antaeus is susceptible only to magic damage types related to elementals that were previously killed. Defeating Antaeus grants a 60-minute time extension and a small chance to receive 4 random 100-piece currencies. Due to the subjob restriction, players entering Dynamis-Qufim while the restriction is in effect will automatically lose all buffs applied outside the Heiroglyphics. 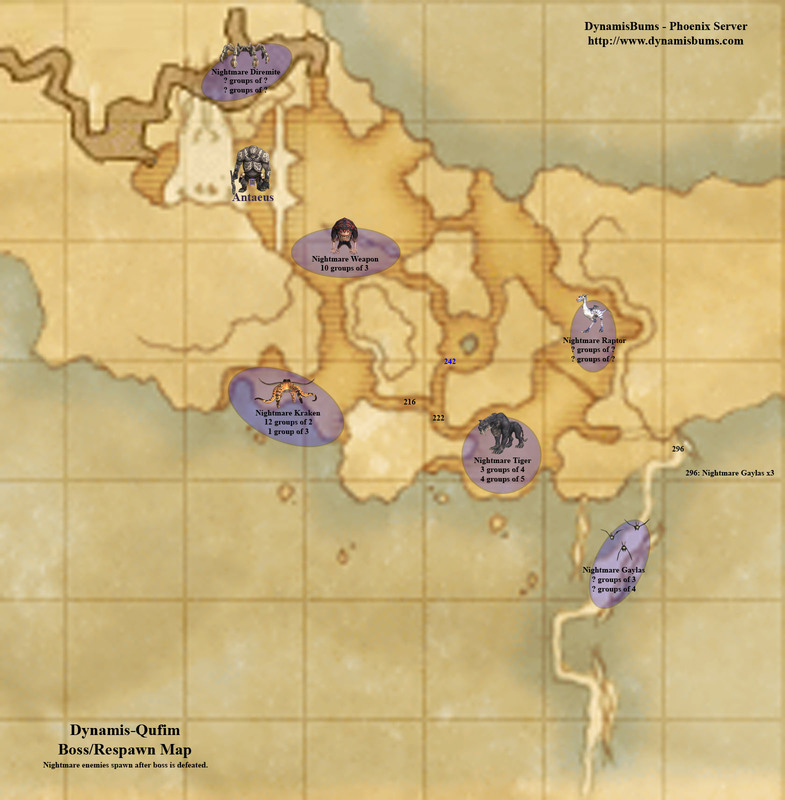 Beastmen in Dynamis-Qufim have a probability of dropping LV73-specific armor.